The authors interpret the new result from HST as placing a lower boundary on an introgression from Africans to Neandertals at more than 290kya, which explains why Africans are genomically closer to Neandertals than to Denisovans. Within the Modern Humans, Eurasians are a branch of a tree which is mostly African. This has been interpreted for decades as evidence for the Out of Africa hypothesis for the origin of Modern Humans. But, within the phylogeny as a whole, Modern Humans are a branch of the Eurasian tree. This has not (why?) in general been interpreted as evidence for Out of Eurasia for the common ancestor of Modern Humans and Neandertals. It seems to me that this hypothesis, that Modern Humans and Neandertals stem from a non-African ancestor (a non-African population of H. heidelbergensis, for example), has much to recommend it. Eurasia has twice the size of Africa and has been home to hominins for ~1.8 million years. It was inhabited by diverse hominins, and thanks to blind luck we discovered that as late as a few tens of thousands years ago, it also sported two of the populations that split off before anyone else: first H. floresiensis, and second Denisovans. While a North African source of modern humans is plausible, the data seems to favor a Eurasian origin of the (Modern Human, Neandertal) ancestor. Ancient DNA is revealing new insights into the genetic relationship between Pleistocene hominins and modern humans. Nuclear DNA indicated Neanderthals as a sister group of Denisovans after diverging from modern humans. However, the closer affinity of the Neanderthal mitochondrial DNA (mtDNA) to modern humans than Denisovans has recently been suggested as the result of gene flow from an African source into Neanderthals before 100,000 years ago. 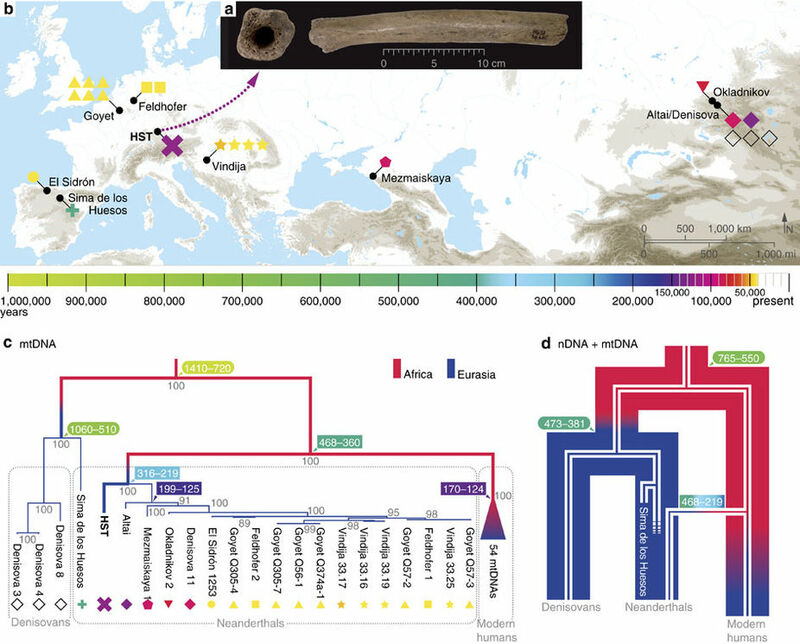 Here we report the complete mtDNA of an archaic femur from the Hohlenstein–Stadel (HST) cave in southwestern Germany. HST carries the deepest divergent mtDNA lineage that splits from other Neanderthals ∼270,000 years ago, providing a lower boundary for the time of the putative mtDNA introgression event. We demonstrate that a complete Neanderthal mtDNA replacement is feasible over this time interval even with minimal hominin introgression. 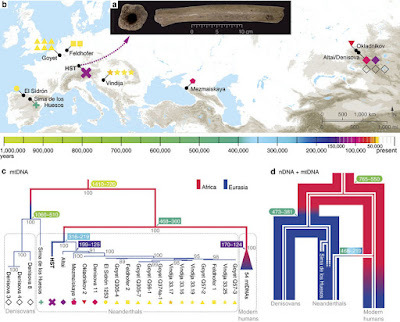 The highly divergent HST branch is indicative of greater mtDNA diversity during the Middle Pleistocene than in later periods.